The Sheep Whisperer: Ewe Quack me up! I Hope EWE grasp the meaning of "Answering the Call"! 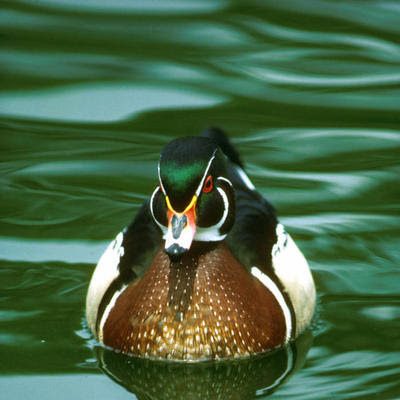 Wood Ducks are migratory birds that are well known in North America for their beautifully colored plumage! Wood Ducks were in danger of extinction in the early 1900's, however, laws were passed to protect them & they have rebounded nicely. This has occurred largely due to the work of Conservationists, even building "Nest boxes" to assist them in finding appropriate nesting areas! 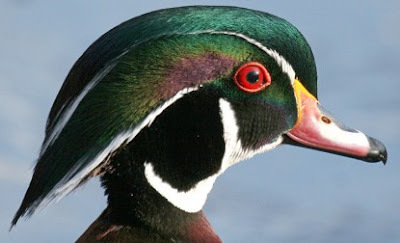 Most Wood Ducks nest in areas where a 10-acre body of water is accessible, such as ponds, freshwater swamps, & marshes.They need appropriate water plants, such as cattails & reeds, to provide both cover from predators & food while their clutch matures.They seek to nest in the hollow of a tree, which ranges from 5ft.-290ft high & is near water.The primary reason for the height of the hollow is for the protection it offers from predators, such as raccoons, weasels, & mink! Swimming relaxes me so that I'm better equipped to deal with the ducklings! woodpeckers, squirrels, or decay, must not be too deep. It must be suitable to the young ducklings' ability to crawl up to the opening & leave! 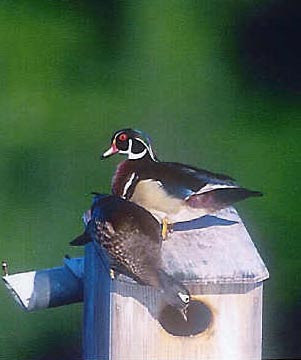 "Nest boxes", built specifically for Wood Ducks, are also used. Once the nest is selected, the female plucks feathers to insulate the nest. She proceeds, laying one egg a day until her 10-15 eggs are laid. She then initiates the 30-day incubation period, which almost guarantees the birth of her clutch at the same time! I wish these kids would hurry up & hatch! 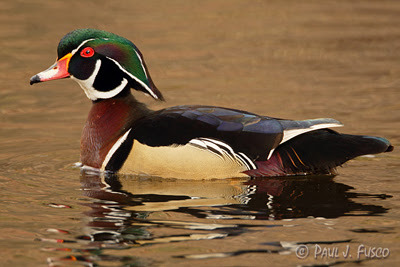 Did ewe know that mother Wood Ducks actually talk to their eggs? About 2 or 3 days before hatching from their creamy-white shells, she listens to the eggs. As she hears "peeping", she calls back to them, acquainting them with her voice. 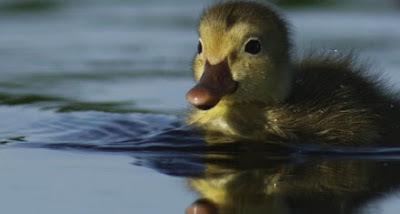 The ducklings, equipped with an "egg-tooth" on the end of their bill, then begin to break out of their shell. Once out of the shell, the damp duckling must dry out in preparation for the first huge task that will take place, usually within 24 hours! Stay Tuned! I'm branching out but "StayTuned" for the ducklings first step! It's a big one! The female scouts the area very carefully before asking her duckings to take the next big step of their short lives.Once assured of no predators in the area, she calls her ducklings to the opening of the nest. Then, she calls to them & beckons them to jump! One by one they take this enormous "Leap of Faith", listening to the call of their mother! Unable to fly at 24 hours old, their downy wings & webbed feet help break their fall on the grass below! Now, it's off to the brooding pond for more training before their migratory flight. I will never again jump out of an airplane! I'm joining the Army! 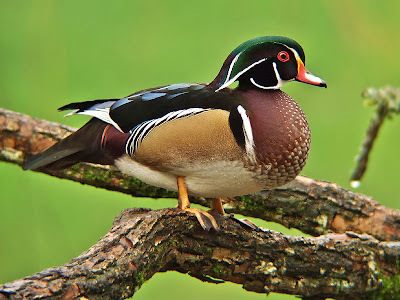 Sheep, like Wood Ducks, also must learn to listen to the voice of their leader.They must cultivate their ability to listen to & obey the voice of their Shepherd. Sheep that are unable to learn this lesson at an early age, will find that they are a real danger to both themselves & the rest of the flock! 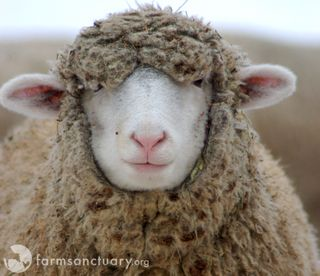 Don't Ewe think I have an innocent face? Today, listen for the voice of the Good Shepherd calling to Ewe! When Ewe hear His voice, be prepared to answer, "leaping" into the plans He has for Ewe! Thank Ewe Anonymous! I'm glad the Blog encouraged! God Bless Ewe & keep listening for His voice! I Just want to be a Sheep,Baaa,Baaa. !